From the Sunshine Coast of South Africa to a remote ashram in India, Ruth Colvin and her husband have traveled around the world, visiting 62 countries and providing literacy training in 26 developing countries. The founder of Literacy Volunteers of America, Inc., which merged with Laubach Literacy in 2003 to become ProLiteracy, Colvin has been invited by universities, religious organizations and the International Executive Service Corp. to share her skills in native language literacy and English as a second language training. “Off the Beaten Path: Stories of People Around the World ” (2011) published by Syracuse University Press, chronicles the literacy pioneer’s life of world travel and the many encounters she had as she taught others to read and write. Throughout her travels, Colvin met people from all walks of life—a holy man in India, a banned leader and a revolutionary in the apartheid system of South Africa, lepers in India and Madagascar, Chinese Communists who truly “serve the people” and survivors of Pol Pot’s Cambodia. According to Colvin, her most rewarding adventures were connecting with individuals from vastly different backgrounds and experiences, learning about their cultures and traditions, and discovering the many similarities all people share. Believing education is the key to facilitating communication and understanding among people around the world, Colvin—a lifelong learner herself—has dedicated her life to teaching others. A Syracuse resident and recipient of nine honorary doctorates, Colvin was given the highest award for volunteerism in the United States, the President’s Volunteer Action Award, in 1987. She received the Presidential Medal of Freedom in 2006 and was inducted into the National Women’s Hall of Fame in 1991. A March 15 book launch is planned at the Onondaga Historical Association at 4 p.m. It is open to the public. 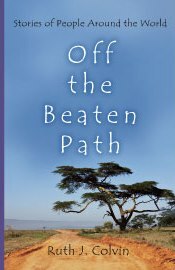 For more information on, or to purchase “Off the Beaten Path,” visit Syracuse University Press at http://syracuseuniversitypress.syr.edu/fall-2011/off-beaten-path.html. It can also be purchased at local bookstores and Amazon.com.